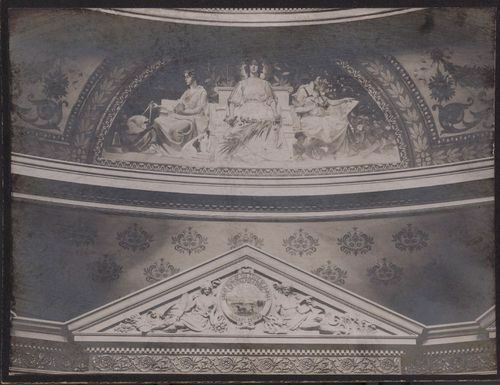 This sepia colored photograph shows a mural of "peace" located on the fourth floor, under the west side of the, capitol dome in Topeka, Kansas. The panel was completed in 1902 under the supervision of painter Abner Crossman at a cost of $7,600 dollars. The fresco panel depicts the allegorical figure of "Peace" in a mosaic background holding a sword intertwined with roses. To her left is "Art" painting at an easel while "Science" measures the globe with a compass on her right.